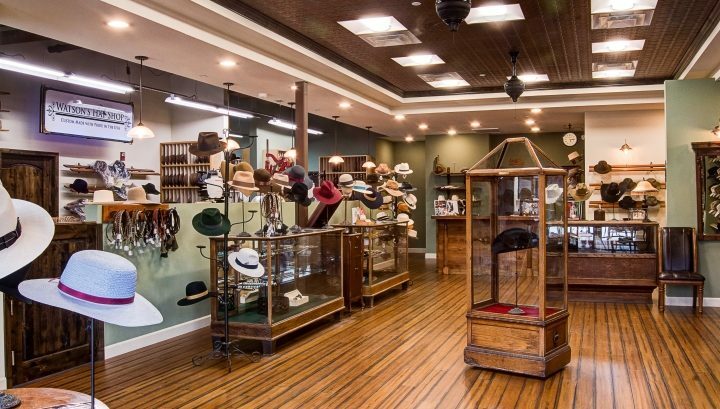 At Family Owned & Operated Watson’s Hat Shop, we handcraft some of the finest cowboy hats, fedoras, Aussie hats, fine ladies hats, and panama hats. We purchased one of the oldest hat shops from 1860 in the United States and still use the same equipment to create our custom hats till this day. From this era of Hat Making, a customer could walk into a custom hat shop and the hatter would tailor-build the hat from the ground up just as the the customer wanted. Our custom hats are made to last a lifetime and we stand behind our every hat we make. We are proud to have All American made materials used in every aspect of our custom fur felt hat production. We use only the finest pure beaver fur felts to create our custom hats. Each hat is cared for just the same as the next with precision and respect. At Watson’s Hat Shop we offer some of the finest blends of pure beaver, beaver blend, and European Hare (i.e. rabbit fur felt). Also, you will find that we make our hats from the finest Panama hat bodies (hand woven in Ecuador). You can choose from up to 34 different colors of hats, and various styles of ribbon with the choice of 7 different widths. Also, we have custom leather hat bands, braided horse hair hat bands, custom silver and gold hat bands with your choice of gem stones, and braided kangaroo hat bands, and custom stampede strings. All our hat bands are custom made here in the USA. We can even customize the hat band with your ranch logo, racing logo, or a special design. Maybe there is a favorite movie or hat that you would like made? No problem, just stop in and let me know exactly what you would like. If you’re not sure, what hat may look good on you and fit your face and body features then leave it to us. This is where our artistic ability really comes into play. Together we will customize a great looking hat that you will love and be proud to wear for a long time.